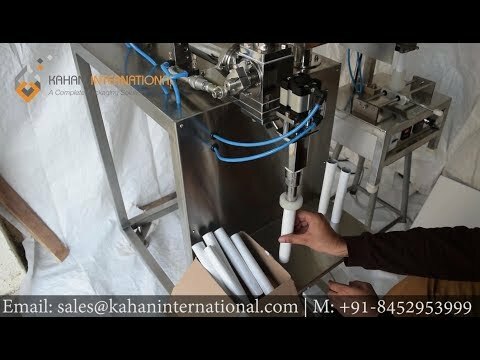 Kahan International - Specialization into Tube filling and sealing machine offers Low-Cost Tube filling and sealing solution for a startup/smallscale based companies with a low output of the tubes getting filled and sealed. In these machines, there is 2 two separate operation for filling as well as sealing in two separate machines. The tube in the range of 5 gm to 250 gm are filled by the operator and filled tubes are sealed on the tube sealing machines. In sealing, there are 2 different steps: One is the hot jaw tube sealing and another step is trimming and coding operation which gives a well finished sealing and coding quality. We give Quality Assurance in terms of fill weight accuracy, leakproof sealing and well as well finished look of coding. We can provide small compact models as well for R&D purpose, especially which will occupy lesser space. These machines are suitable for both Laminated as well as Plastic tubes. Shutoff Nozzle provided to avoid dripping in the pneumatic model. Position Indicators for Volume Adjustment position indication in pneumatic model. FRL provided with the machine in the pneumatic model. Suitable capacity SS Hopper provided for material storage. Piston with silicone O-rings in the syringe is provided for smooth operation. All pneumatic parts if applicable will be of Janatics / Pneumax /Festo /SMC. Dive-In Nozzles for small mouth diameter of the bottle can be provided. Siemens/ ABB/ Schneider/ Delta Make Variable Speed Drive for varying the speed of the motor to control filling speed. Foot Switch based operation can be provided for a pneumatic model. A pump suitable for the product can be provided to fill the material from ground automatically into the hopper. Jacketed hopper (Water/Oil/Steam based) can be provided to heat the material up to 120 degrees as per the requirement with SELEC/UDIAN make temperature controller. Stirrer can be provided with suitable shape blades for homogenous mixing of the product and temperature in the jacketed hopper. 2 gm to 1000 gm with the help of change parts of syringes. Filling the range of 2-10 ml, 10-30ml, 30-100 ml, 50-250 ml, 100-500 ml, 250-1000 ml are standards we define. Glue, PVC Solvent, Grease, Floor Cleaner, Paints, Chemicals, Lubricant Oil, glycerine, rose water, pesticides. Up-to 35 Bottles/Minute (BPM) depending upon the number of heads, product viscosity and density and also on the experience of the operator. 0.5 HP to 1.5 HP varies as per filling size. Depending on the number of heads and filling capacity. Available with SS 304 / SS 316 / SS 316 L contact parts as per the customer’s requirement. Complete machine construction in Stainless Steel can also be provided. I would like to enquire about Toothpaste Tube Filling and Sealing machine KI-STFS .